Brittain and Johnston, and were occupied until the building was burned in 1876, when a separate structure was erected. 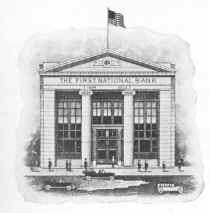 In 1884 the concern was rechartered under the name of the First National Bank of Greenville for a term of twenty years, and again in 1904 for a like period. The history of the bank is a record of continued progress, both in business and reputation, and for many years it has stood for one of the most substantial financial institutions in Mercer county. Among the oldest officials in point of continuous service is George G. Stage, now  president of the bank, who first became a stockholder in 1870, at which time he was elected vice-president. He has held the presidency since 1895 and to him, more than to any other one man, are its steady progress and present standing legitimately due. The First National Bank was chartered in 1804, under the corporate name of the First National Bank of West Greenville, and began operations with a capital stock of $60,000. One year later this was increased to $100,000, and five years thereafter to the present amount, $125,000. The prefix “West” was dropped at the same time the name of the borough was changed. The building in which the bank first commenced business was a brick structure on Main Street, the dwelling of its first president, Samuel P. Johnston. 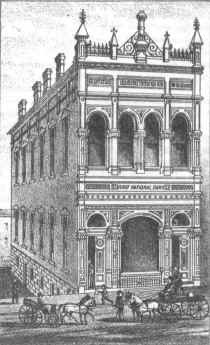 Subsequently the room occupied by Brittain & Johnston was secured, and the business of the bank was conducted therein until 1876, when the building was destroyed by fire, and the present quarters, costing $14,000, erected. The present officers of the institution are: President, Marvin Loomis, elected in 1888 to succeed Hon. William Waugh, who served from 1875; vice president, Robert S. Johnston; cashier, Calvin R. Beatty. The general history of the bank’s operations has been one of gradual enlargement and growth. There have been no serious reverses, and the condition of the establishment to. day is best evidenced by the fact that it has a reserve fund of $35,000, and that its deposits amount to over $150,000. Under the name of First National Bank of Greenville it was re-chartered in 1884 for a period of twenty years. W. S. McKay was President of the bank in 1925. R. A. Horne was Cashier.